Gigo Propaganda (b. 1979) is an artist as well as director & curator. In 2003, he founded Storp9, a center for culture and education which provides a wide range of culture activities to tens of thousands of members of the community and beyond. From 2005-2008 Gigo founded and ran Gigoleria, a non-profit art space which hosted exhibitions, performances, theatre plays and more. From 2010 to 2015 Gigo founded and ran the art space Muralistisches Zentrum (Mural Center). 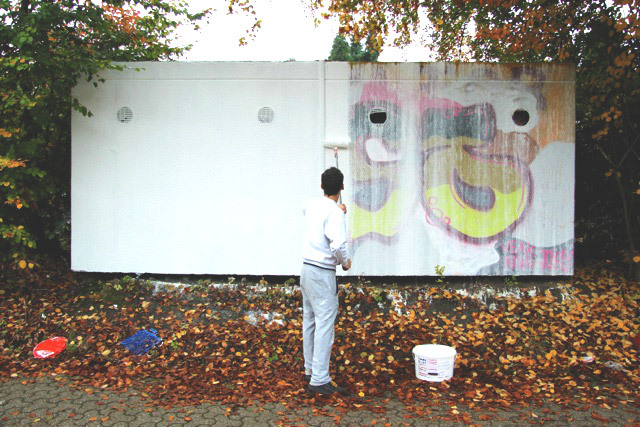 In 2012, Gigo initiated the world’s longest mural on 3.500m in Essen, Germany. Wände SüdOst invited 21 international artists and was almost entirely self-funded. In his work, Gigo often addresses social issues such as the on-going refugee issue. He has an extensive history of working with schools, refugees and disabled people. His process is mostly participatory and collaborative, including other artists, schools, public institutions and the community, with performances in public and private spaces, street festivals, neighborhood walks and workshops. Gigo has worked extensively in public space, both sharing his own works as well as starting an initiative for removing billboards with advertisement and painting the walls that were hidden prior to this. This project lasted for more than 10 years. In the past years, Gigo has formed a public discourse, often starting public discussion mostly through his portrait works. He is also founder & editor of the magazine Headshot. Gigo spends his time between Essen, Germany and Mostar, Bosnia and Herzegovina. – LehmbruckMuseum, Duisburg, Germany – plastikBAR / BAR jeder Architektur? „Graffiti – Sachbeschädigung oder Kunst?